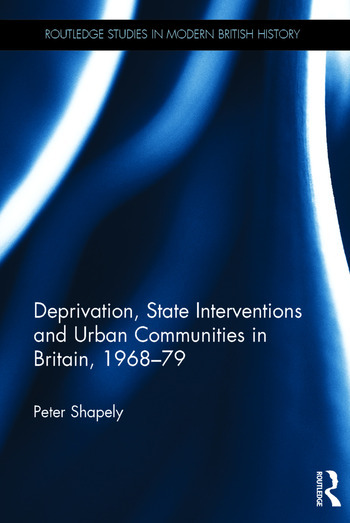 Focusing on a series of policy initiatives from the late 1960s through to the end of the 1970s, this book looks at how successive governments tried to address growing concerns about urban deprivation across Britain. It provides unique insights into policy and governance and into the socio-economic and cultural causes and consequences of poverty. Starting with the impact of redevelopment policies, immigration and the rise of the ‘inner city’, this book examines the pressures and challenges that explain the development of policy by successive Labour and Conservative governments. It looks at the effectiveness and limits of different community development approaches and at the inadequacies of policy in tackling urban deprivation. In doing so, the book highlights the restricted impact of pilot projects and reform of public services in resolving deprivation as well as the broader limits of social planning and state welfare. Crucially, it also plots the shift in policy from an emphasis on achieving statutory service efficiencies and rolling out social development programmes towards an ever-greater stress on regeneration and support for private capital as the solution to transforming the inner city. Peter Shapely is a Reader in Modern and Contemporary History, Bangor University.